With a few exceptions, we see most markets firming at the moment in spite of rather slow activities in most markets; at least in Europe. This may be caused by more activities in other parts of the world, like buying in anticipation of the Ramadan period and more demand from the Asian continent. Also a remarkable movement of the dollar, which is getting weaker against the euro, but also against many domestic currencies of the producing countries. At time of writing we noticed a level of almost 1,25 for the euro/dollar, against 1,20 a few weeks ago. The prices for Turkish apricots rose sharply in the last weeks. Farmers and handlers have sold well and are in a comfortable financial position and have no need to sell. Moreover the remainder of the crop is mainly small sized and a substantial percentage must be regarded as ‘industrial’ quality. Next to this there are signs of an early bloom, so the risk of frost in the most vulnerable stage of the crop is higher than usual. Especially prices for nr. 5 and bigger are firmer for obvious reasons. The measurements of the Chinese government to enforce all kind of regulations by even the shutdown of many factories in China in the battle against pollution, has caused not only delays in shipments but now also has made prices to rise sharply. Short supply on the spot and firm prices in origin are translated in higher prices for the Chinese apple products at this moment. We do not foresee any improvement until the new crop (arrival end 2018), so may well advise you to have a look at your needs, as we see no downside in this market. Prices in the Philippines are stable, which makes prices for the European buyers more attractive to step in. A disappointing return from the fields (bogs) has led to a more and more firmer market. For sure we have left the lowest level ever seen, but the price for the cranberries is still historically low. Being on the ‘long’ side will not be a major risk…..
Greece is virtually sold and those rare containers offered, a premium price have to be paid for obviously. Also the news from South Africa, where the drought in the Vredendal area most probably will cause a 20% smaller crop, is not a good sign. Practically unchanged situation. Some tighter situation for the natural papaya, now shippers are only selling with a max of 5 to 10 tons per fcl to be taken with other products. Prices nevertheless stable. Chile is expecting a crop of 80/85K mtons and a carry-out of 10K approximately. The main size on average is in the 60/80 range. Prices expected to be a continuation of the levels of last year. The crop will start in a few weeks and first shipments can be in April. The Californian market is still bullish. Some shippers don’t offer at all and those offering require a 50% over last year’s levels. Apparently they sell enough to have confidence in this level as we see no signs of weakness: on the contrary some shippers increased their prices this week. The ‘big’ question will be: what level the South African major players will drop as an opening price on the market. It is no rocket science to predict it will be way higher than last year. More interesting is to see the ‘distance’ they will keep to the Californian pricing. Of course they will go for a maximum return, but also realize they have to sell the crop. Traditionally prices have to be lower than the Californian as not all industries can or want to work with the South-African product. First indications from some smaller shippers indicate levels ‘in-between’. Chile has announced their first prices and as to be expected, these are a bit higher than last year’s levels. Of course also the Chilean farmers and exporters follow the development in the other producing countries and want to have a piece of the cake. Iran seems to have a somewhat disappointing crop. Not only for their sultanas they quote even higher than the Turkish competitors, also for the goldens – usually the cheaper alternative for other origins – they will be at a similar level and will not distinguish themselves in pricing this season. Italy is the second largest EU-28 almond producer after Spain. Sicily and Puglia are the main almondproducing areas, accounting together for approximately 88 percent of total supply. Tuono, Pizzuta d'Avola, Fascionello, Filippo Ceo, Fragiulio Grande, Genco, Falsa Barese, Ferragnés are the leading varieties grown in the country. 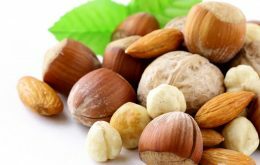 Italy’s marketing year (MY) 2017/18 almond production is forecast to drop by approximately 40 percent compared to the previous campaign due to the summer drought that affected the Italian peninsula. Quality is expected to be good. In-shell almonds are mainly sold for fresh consumption. 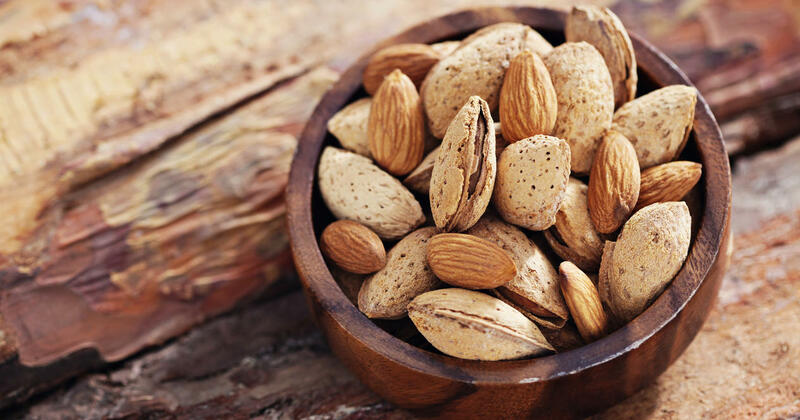 Shelled almonds are milled and generally used as a raw material for confectionary and bakery food companies. In 2016, Italy imported 41,580 MT of almonds, mainly from the United States and Spain, accounting for 62 and 23 percent of total imports, respectively. In 2016, Italy exported 10,075 MT of almonds mainly to France, Germany, and the United States, accounting for 33, 26, and 8 percent of total exports, respectively. Table 4. Almonds in shell (Italy): main importers 2014-2016. Table 5 Almonds in shell (Italy): main export destinations 2014-2016. Pistachio is a traditional crop in Italy, especially in the Sicily region (Bronte area) which accounts for approximately 90 percent of total supply. In recent years, pistachio production has slightly expanded to other areas in Sicily and Basilicata, where newer and input intensive orchards have been planted. Bianca (also called Napoletana) is the main pistachio variety grown in the country and is normally harvested in September. Since 2004, pistachio from Bronte has been awarded by the European Commission as a PDO (Protected Designation of Origin), distinguishing it from all other pistachio varieties worldwide. Pistachio tree production is cyclical, bearing heavily in alternate years. Therefore, after the poor MY 2016/17 campaign, MY 2017/18 will be a ‘higher’ bearing year, despite the frost in April and the hail in May that affected fruit set. Quality is expected to be good. 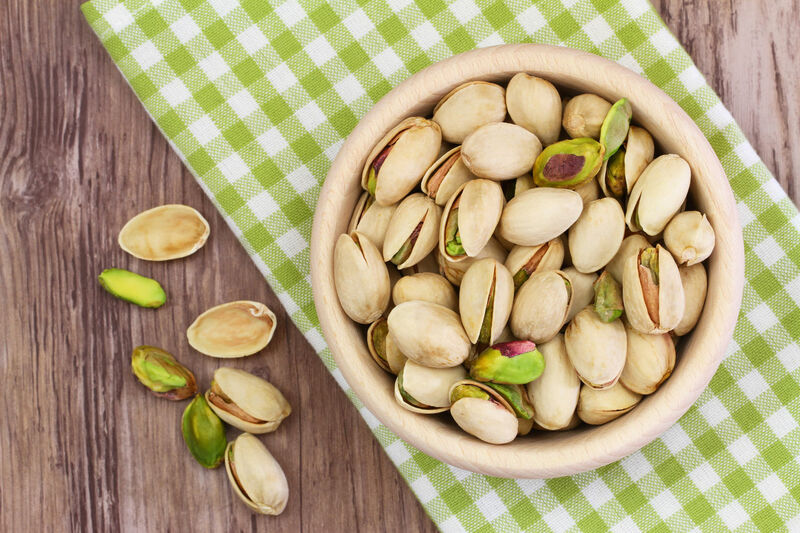 Italian in-shell pistachios are consumed as a snack food. Bakeries and food companies use shelled pistachios, while ice-cream makers mainly employ milled pistachios. Italian pistachio demand is mainly satisfied by imports (14,901 MT in MY 2015/16) from Germany, the United States, Greece, Turkey, and Iran. Harvest in Vietnam started this month, with an expected crop of 218KMT. Selling by speculators in order to liquidate old stock caused additional downward price pressure during the start of January. Brazilian crop in Espírito Santo is being harvested, while the harvest in Para is finished. Buying interest from Latin America is absorbing most of the supply. Brazil is expected to see strongest growth this year compared to other origins, with a 17 KMT increase versus last year, to c. 82KMT. 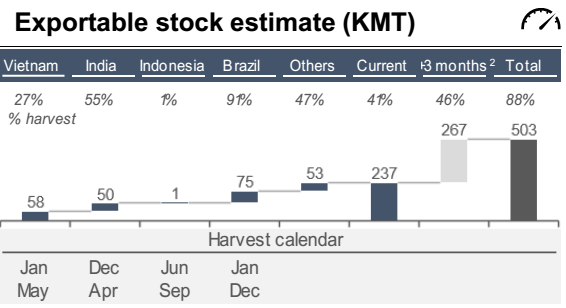 As India is also expecting a record crop of 92KMT, global stocks will likely continue to increase. 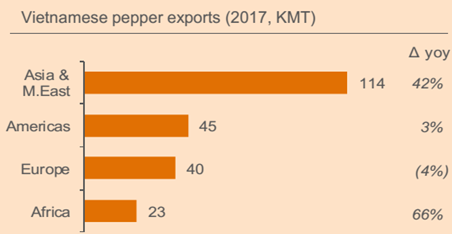 Vietnam exported 222KMT of pepper in 2017 (up 24% yoy). Brazil exported 62KMT during 2017 (up 92% yoy), with exports into North America and Europe increasing 63% and 53% resp. Vietnam’s crop is expected to be 218KMT (+4%) this season, as younger vines compensate for yield loss in older vines. As India is expected to have a record crop of 92KMT this year, and initial berry setting in Lampung also looks promising, we expect a record crop of 575KMT this season. Following the above, global stocks can be expected to increase both in producing countries as in consuming countries, as we continue to be in a period of excess production. − Vietnam entered its harvest, which will pick up after lunar New Year. This, together with selling pressure from the liquidation of old stock will push prices down. Hence, Vietnam will likely replaceBrazil as cheapest origin soon. − The government of India has issued a Minimum Import Price of INR 500/kg, which makes exporting into India more difficult, essentially increasing availability elsewhere further. The decision encourages speculators / farmers to hold back pepper, which may support prices in short term, however in the midterm we expect the bumper crop to trigger selling pressure. 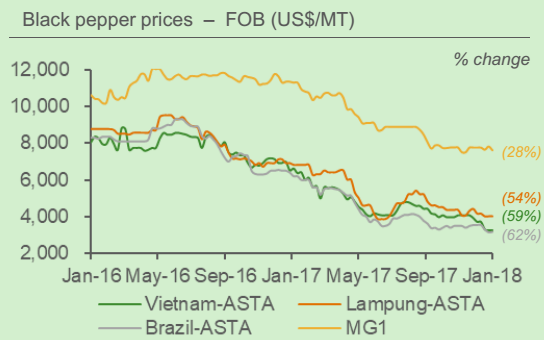 − With already significant stock levels in origin, the record arrivals expected in Vietnam, India and Brazil over the next 3 months will put further pressure on prices, which already dropped by up to 60% over the last 24 months. 1) FOB prices. Change shown versus last month. The past week has seen an increase in the price of Turkish sultanas as local packers struggle to find raw material. Prices have been stable for several months, but following the global shortage of raisins have now started to increase. As an indication good quality standard No. 9 sultanas are being quoted between USD 1750-1850 pmt FOB izmir. This is a significant increase and the feeling from both UK importers and major Turkish packers is that prices will rise further. In reality there should be ample stocks of raw material to meet export requirements, but as is often the case with any major commodity, markets can be effected by other factors, such as the uncertainty of a smaller new crop. Unsold stocks of Turkish raisins are now virtually non-existent, although some packers continue to offer type No.7 and type No. 8 sultanas, which are darker in colour as a substitute. These should be less expensive than the genuine alternative, but prices have been creeping upwards as available stocks of genuine raisins are nearly exhausted. 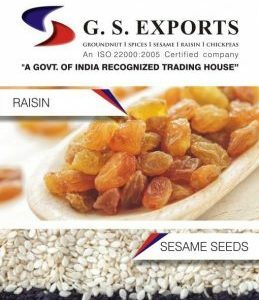 As an indication, genuine Turkish Thompsons seedless raisins are available between USD 2200-2300 pmt FOB izmir with the less expensive alternative at a discount of USD 400-500 pmt on this figure. The good news as reported last week is that South Africa and hopefully Chile are both expected to have good new crops of raisins this year. The southern hemisphere harvest takes place from March onwards with first shipments at the end of the month or early April. Prices are expected to open at high levels with first indications from South Africa for choice Thompson raisins at between USD 2150-2250 pmt CIF Felixstowe. Californian raisin prices remain high at between USD 1.50-1.60 per lb C&F Felixstowe. This year the quality is not expected to be as good as last year, due to the difficulties caused by rain at harvest time. Some UK buyers however continue to purchase US raisins as a premium product and sales may increase in the short term if available stocks from other origins such as Turkey begin to run out. Early reports from South Africa suggests that this year’s vine fruit crop will be between 50,000-65,000 tonnes. The harvest is reported to be about one month away and weather conditions have so far been good. A late frost did reduce the vine fruit crop in some areas and the berry weight might be lower than last year, resulting in a slightly smaller tonnage. The good news is that the earlier drought in South Africa has had no real effect on the size of the vine fruit crop grown in the Upington area due to good rainfall around the Orange River. Most of the vines for the South African dried fruit industry lie alongside the Orange River, which irrigates the vines in the same way as the Murray River does for the Australian growing area around Mildura. The situation north of Cape Town, however, is likely to be more difficult as most of the farmers there will have much shorter crops following the drought. This might reduce the overall size of this year’s South African currant crop which is unfortunate news for the UK dried fruit industry, which is struggling to obtain supplies from Greece. As reported previously, unsold stocks of Greek currants on the UK market are now very limited and there are still very few, if any, new offers of Greek currants for shipment. Spot prices have therefore increased to between GBP2,200-2,400 (USD2,970-3,240) per tonne for good quality provincial fruit. Turkish apricot prices have stabilised following earlier price increases. In theory there is more than sufficient fruit to cover forward sales until the harvest in August, the total crop is estimated to be 142,460 tonnes but as ever is the case, local farmers remain cautious awaiting possible frost damage in the orchards in March/April. As an indication good quality whole pitted type No. 4 apricots are being quoted between USD 3600-3750 pmt FOB Mersin, Turkey. Turkish fig prices are also unchanged over the past week with good quality type No.6 natural and Lerida figs quoted between USD 5000-5250 pmt FOB izmir. Ordinarily prices would have reduced after the seasonal December peak in demand, but this year due to increased sales to new markets, prices have remained firm. Local exporters do not expect prices to reduce before a new crop becomes available next September and prices could increase as Ramadan approaches and local demand rises. December was not an active month for the Chinese pumpkin exporters. Most of the European buyers had covered their needs for 2017. The domestic Chinese market stays high. By the middle of January we see a growing interest again for spot material. The combination of the favorable price tags of the material and the interests from the market to cover longer spreads puts some pressure (risks) on the table of the pumpkin exporters in China. Right now the availability is good and it’s easy for the processor to buy from a local raw material trader. In the current market situation, there is no need for the processors to keep stocks. This seems stable and positive but is also a risk for the processors and the possibilities for price changes for the buyers in Europe. Quality and availability driven increase. Right now we see the market increase on the higher quality kernels. For example the prices of the Shine Skin AA from the North West (Xibei Origin) are rising. The availability is not so big and the domestic use is high. Some big processors have slowly started taking some positions of the raw material from the North West which makes other (smaller) processors consider the same. For these specific quality kernels, we expect the market will not make a huge jump, but we expect it will keep increasing during the next months. How fast it will increase is important of topic no 2 like explained here below. Speculation driven increase. These days the pumpkin market is more speculation driven as the available volumes are simple high (expect some high quality kernels like AAA grades and Xibei Origin Shine Skin like mentioned before). There is a huge immediate available volume North east origin Shine Skin and the stocks of GWS are also still good.Right now processors are not eager to offer long period contracts (financial capacity wise) or they ask for a premium price to ensure their margins. If they don’t do this, it might be a gamble to see if they can make some profit. As mentioned before we still see a big difference between the origin prices and the local spot prices in Europe. Spot availability is high these days, due to the rising interest at the start of 2018. Right now we see the following market levels FOB China. Right now, the pumpkin market is at a stable low level, which gives the opportunity to buy good quality seeds at attractive prices. Especially the prices for nearby shipment are attractive. If you would like to take advantage of this favorable market, we advise to consider covering your needs until the summer period. Please be aware that suddenly powerful processors can start collecting quantities of raw material for storage if they see growing interest for the next coming months. This can break open the market and makes the prices increase fast in a short time. 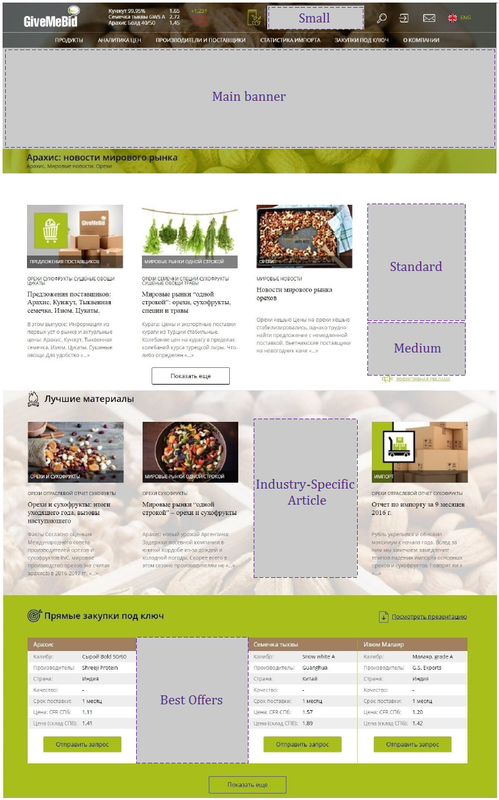 [post_content] => GiveMeBid is the most popular online media in nut and dried fruit industry. We provide information on market situation, unite producers and buyers on one platform, assist in finding new partners and promote direct purchasing. [post_content] => At the time when Saint Petersburg hosted Economic Forum and experts shared their views on when the Russian economy would bounce back from the bottom, we were preparing our next scheduled import report which confirmed that import of the majority of nuts and dehydrated fruits increased year on year and maybe, these are the first signs of recovery? 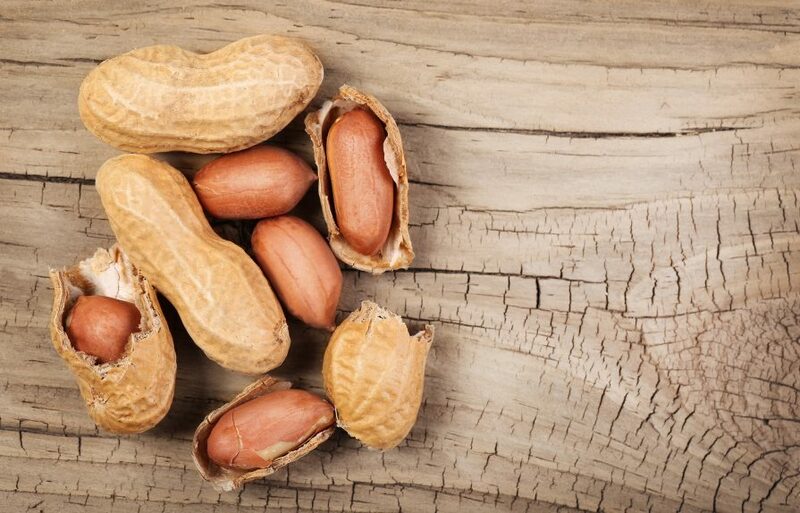 Russian peanuts import has increased by 13% in the first five months of 2016 to 38,5 ths tons compared to 34 ths in 2015. Among exporting countries, Argentina firmly holds and expands its dominant position in the Russian market – from 16 ths tons in 2015 to 20.6 ths tons in 2016. Import of Brazilian peanuts rose by four times – from 3.5 ths tons in January – May 2015 to 13,5 ths tons in the same period 2016. Nicaragua has reinforced its position in Russia – peanut import volumes jumped by 60% to 1.2 ths tons in January – May 2016. 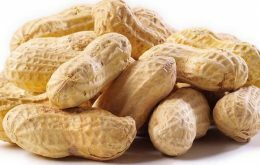 Peanuts import from Uzbekistan has rocketed from 12 tons in 2015 to 358 tons in 2016. It’s a drop in the bucket on a global scale and in comparison to volumes of the largest peanuts exporters to Russia, but this represents an apparent success of the country and an opportunity for the purchasers to diversify supplies with shipments from Central Asia. While the exporters from Latin and Central America increase their share in the Russian market, India and China evidently lag behind. Indian exporters have lost up to 80% of their share in the Russian market – their volumes plummeted from 10 ths tons in 2015 to 1,5 ths tons in 2016, which represents a major setback. The volumes of China peanuts import has reduced by 42% and totaled 946 tons by the end of May against 1.6 ths tons YoY. Russian raisins importers have started the year quite rigorously, month by month increasing the import volumes and added 23% to import volumes of the previous year – 10 ths tons in 2016 vs. 8 ths tons in 2015. Iran holds the leading role among exporting countries. While the total shipments of Iranian raisins reduced by 5% in the first quarter of 2016, the Islamic Republic not only regained the weakened role in the Russian market, but even secured the garland, leaving Afghanistan behind. Currently, the volume of Iranian raisins import to the Russian Federation amounts to 4.1 ths tons versus 3.2 ths tons in January-May 2015. Traditionally the main challenger in the Russian raisins market is Afghanistan, which is now lagging behind not only Iran, but remains even short of its own performance with 2.9 ths tons in January-May 2015 versus 3.2 ths tons in 2016. India burst into the Russian market with a lightning speed, boosting the raisins import volumes in ten times – from 116 tons in 2015 to 1 thd tons in 2016. The same with Chile – the shipments volumes rose twice. Though sad news about the new Chilean crop are coming – Jumbo Golden suffered heavily from rains, and producers are forced to reduce the exports volumes, which might affect import to Russia as well. 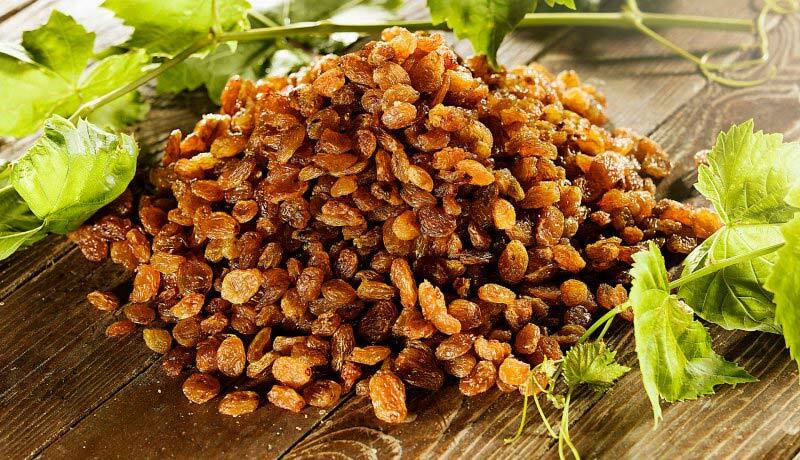 Share of Turkish raisins in the Russian market has reduced by 20% to 494 tons. The new season of Sultana is on the way – producers are waiting for a high yield and the EU decision on chlorpyriphos. Walnut market is rising. Import volumes have risen up to 225 tons, which is by 10% more than in January-May 2016. 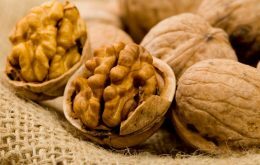 Chile remains the main supplier of walnuts to the Russian market. But distressing news are coming from Chilean manufacturers – incessant rains in April have damaged new walnut crop. The forecast of future import volumes will not be accurate until we have official figures on new crop. Price increase, raw materials shortage and cashew nut import duty in India determine the situation on the global market, but, at first sight, bypassed the Russian market – the total surplus of cashew supplies in spring months amounted to 23% - 924 tons in March-May 2016 vs. 751 tons in 2015. Though this fact hasn’t influenced the overall volume of import to Russia much, Russian purchasers made up a part, but came off in the red – only 1.5 ths tons of cashew nuts were imported to Russian in the first five months of 2016 in comparison to 2.2 ths tons in the same period last year. Vietnam preserves the dominant position in the Russian market year in year out, and the only competition to the Asian giant may be provided by its own self, amid insignificant supplies from India due to high price and mean quality of raw materials. 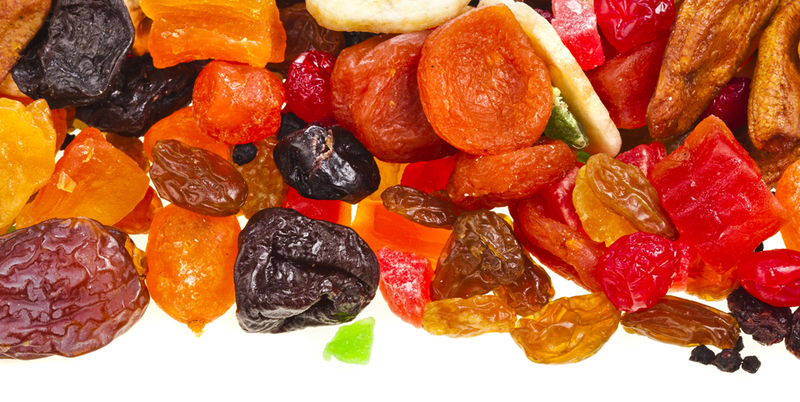 Import volumes of dried apricots continue rapid growth since the beginning of the year. As of the end of May supplies to Russia have doubled in comparison to the same period last year and totaled 2.1 ths tons. Turkey is a traditional top performer with 1.8 ths tons, which is 3 times more than in the last year. Tadzhikistan is striving to keep the head above the water, though quite uncertainly – only 40 tons in January-May 2016 vs. 258 tons in the same period previous year. Chinese dried apricots are gaining popularity in the Russian market: only 18 tons were imported from China in 2015, currently this figure rose to 283 tons. China has made ample amends for dried apricots from Tadzhikistan in the market. First shipments of new crop will start in August. Spring freezes have damaged apricot trees growing in lowlands, but the farmers expect large yield this year. The carryover amounts to 20-30 tons, so there are no doubts that there will be plenty of Turkish apricots to cover Russian demand. 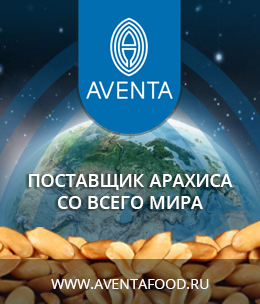 Despite the persisting global demand for almonds, its import to Russia continues to decrease. As of the first five months it fell by 30% to 745 tons YoY. 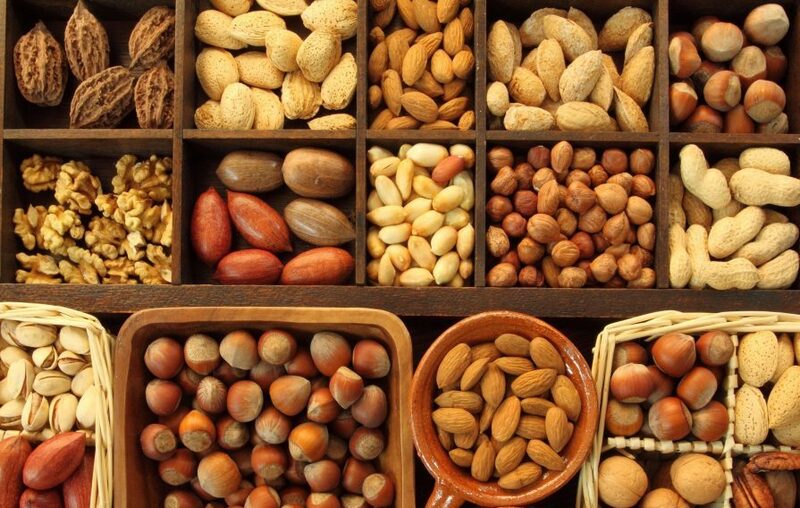 Main almond exporting countries to Russia are Chile, UAE, Turkey and China. China is gaining the leading position now, it has raised its supplies by 1.5 times to 350 tons. China is followed by Chile, which increased its supplies by 4% in comparison to the same period previous year to 245 tons. Iran is practically the only supplier of pistachio to Russia. The current pistachio import volumes to Russia amounts to 1.013 ths tons, which is by 11% more than in the previous year and the main share of it – 1.007 tons falls on Iran. In January and May the import volumes were lower than in the same period previous year – 150 tons vs. 287 and 34 tons vs. 157 tons. But the shortage was more than compensated in February through April, making the overall import volume in the first half of the year by 80% higher YoY, totaling to 829 tons. The import volumes in January through May rose by 5% from 2.5 ths to 2.6 ths tons YoY. Azerbaidzhan, Turkey and Georgia occupy the whole market. The leading position preserves Azerbaidzhan for the second current year, it has increased shipments to Russia by 50% YoY to 1.7 ths tons. Turkey follows the leader with 518 vs. 952 tons. Georgia has liven up, but its influence on the Russian market is still far from the Afghan. Anyway, if the rise will continue, it can achieve the second position – its export volumes to Russia have risen by 46% from 2015 to 390 tons. Prunes import to Russia increased by 1.5 times in the previous five months – 5 ths tons vs. 3.2 ths tons in 2015. Mainly due to the rise of import of prunes from the Latin American countries. As of the end of May 2016, the prunes import from Chile has rocketed by 70% to 1.7 tons. Argentina is gaining more and more interest from Russian purchasers – 1.7 ths tons in January-May vs. 389 tons YoY. Currently Chilean and Argentinean manufacturers are reluctant to offer – they are waiting for official information in prunes volumes in the USA. Upward price trend is expected to persist amid lower yield of plums in California. How this will affect the Russian import volumes is yet to be seen. European exporters give ground. Moldova retained the previous year volumes – 1.16 ths tons in January – May 2016 vs. 1.2 ths tons YoY, but Serbia has lost half of its export volumes – 247 ths tons in the same period. Russian sesame market is stiff and stable – import volumes continue rising. Import doubled in the first quarter 2016 – 2,4 ths tons vs. 1,3 ths tons in 2015, in April – May it gained only 5% from the previous year – 1.43 ths tons vs. 1.37 ths tons in 2015. India was the main sesame supplier to Russia – in January – May 2016 it strengthened its positions in the Russian market and increased supplies by 40% - from 2.6 ths tons in 2015 to 3.7 ths tons in 2016. Mexico does not pretend to conquer any significant place, but furnished a small share in the Russian import chart – 154 tons in January-May 2016 vs. 75 tons in the same period of the previous year. Totally, the overall volume of import rose by 55% in the first five months 2016 YoY and amounted to 3.8 ths tons. Dried fruits import decreased by 7% in the first months 2016 – 4.1 ths tons vs. 4.4 ths tons YoY. Import volumes from Thailand, the main supplier of dried fruits to the Russian market, remained as in the previous year – 1.9 ths tons. Import from Philippines rose by a quarter to 264 tons, import from Poland increased insignificantly by 3% to 438 tons. 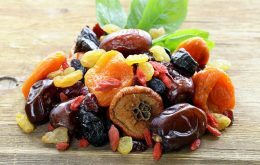 Turkish dehydrated fruits import plummeted in two times from 863 tons in January – May 2015 to 462 tons in the same period 2016.China has lost 10% of its Russian dehydrated fruits market share with 519 tons, but is still the second larger exporter of dehydrated fruits to Russia after Thailand. Pumpkin seeds import volumes in January to May 2016 remain on the same level as in 2015. But if we look at the monthly import breakdown and compare the figures to the previous year volumes, we can see a curve ranging from high above and low below the levels of the previous year. 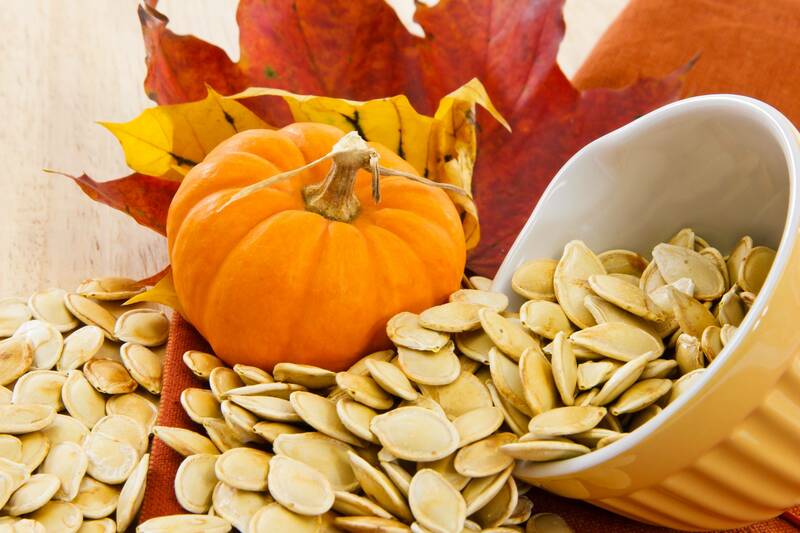 China is the main supplier of pumpkin seeds to Russia and the changes in Chinese pumpkin seeds export volumes directly affect the Russian import figures.